Buying a Sapphire is much less technical than buying a diamond. Diamond's are treasured for their brilliance while sapphires are loved for their color. Since it's all about the color, you need to buy your sapphire from a site that has high quality images of their stones. Not only do reputable jewellers offer loose gemstones, but they make stunning jewellery with sapphires. Sapphires have been the darling gemstone of the royalty and well to do for centuries, so it's no surprise that they've gained in popularity of late as the center stone or accent stone in bridal and fashion jewellery. The ancient Persians believed that the earth rested on a giant sapphire, which reflected its color to the sky. Another legend holds that the tablets of the Ten Commandments were made of sapphire and were so strong that they could withstand a hammer's swing but would smash the hammer to pieces if struck. The word sapphire most likely comes from the Hebrew "sapir,' as it is understood in the Hebrew Bible to refer to blue sapphires. Sapphires, members of the corundum family of minerals, usually refer to the blue variety unless otherwise stated. The other varieties include pink, yellow, green, orange, brown, clear and red - otherwise known as rubies. Sapphire is September's birthstone and the traditional wedding anniversary gift for the 5th and 45th year. They score a 9 on a scale of 1 to 10 on the Mohs' scale of mineral hardness, second only to diamonds at a perfect 10. Beautiful 5.09ct sapphire with great saturation. 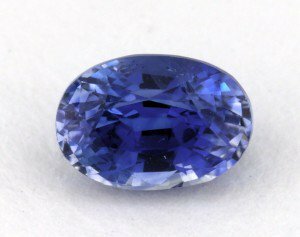 A sapphire's hue describes the stone's balance of color as it relates to its neighbors on the color wheel. 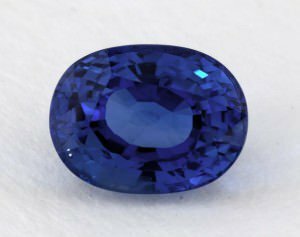 With blue sapphires, for example, we would call the stone's color either blue, slight green, strong green, slight purple, or strong purple. The closer you can get to "true" blue, the more expensive and desirable the sapphire will be. It's common to refer to this variety of sapphires as "cornflower blue,' as the cornflower is one of the few flowers said to be purely blue and not violet or purple like most other "blue" flowers. Tone describes how light or dark the color is with the range going from very light to very dark. It's best to stay in the medium to dark range with tone, as the lighter the tone, the more watered down the overall look of the sapphire. Finally the saturation describes how vibrant the color is with the range going from dull/weak to pure vivid. The closer to pure vivid you can get, the better the sapphire's color will appear to you, and the more money it will fetch. 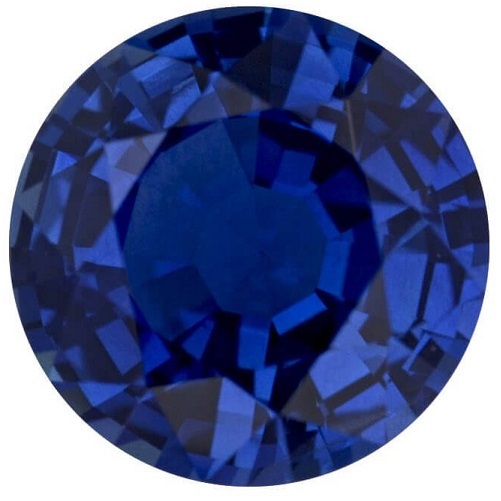 As we said, the most desirable sapphires will have vivid, highly saturated color without areas of brown or gray. These areas are known as extinction and are affected by lighting quality, position, tone, and cut. Usually the darker the stone's color, the darker the extinction will be as well. 0.96ct sapphire with weak saturation. Whereas diamonds have an elaborate, standardized color grading system, sapphires and other colored gemstones have no such similar way to assess color across the board. This lack of uniformity means that it's harder to compare two sapphires since one won't be graded "D" and other "J." Rather, you will have use your own judgment about which colors appear vibrant and alive to you. Of course, the better the sapphire's color, the higher the price tag will usually be, but be sure to buy only from reputable gemstone jewellers. Besides the renowned blue sapphire, there is the Padparadscha Sapphire, an extremely rare and sought after pink-orange fancy sapphire originally found in Sri Lanka. This sapphire can fetch over $20,000 per carat! The name comes from Sanskrit/Sihalese "padma raga," which means "lotus color' since the stone's color is reminiscent of a lotus flower. You can find treated sapphires that look nice,. But the color just doesn't look quite the same. In the United States, there must be a minimum color saturation in order for the stone to be called a ruby. In other places, the term ruby may be used more loosely. It is highly unlikely to find sapphires without any inclusions, or imperfections, at all. If there are no inclusions, gemologists will suspect the sapphire to be fake or treated. As we explained in our guide about rubies, all sapphires will have rutile needles or "silk". Whereas with diamonds, gemologists use 10x magnification to inspect the diamond's inclusions, with colored gemstones, we are only concerned with non -magnified careful examination. In other words, we are looking to see if the stone is "eye-clean" to the naked eye. The cleaner the stone, the higher the price tag. There are no standardized cuts for sapphires as there are with diamonds. Whereas with diamonds you could choose an "ideal" cut to showcase the diamond's color and fire, with sapphires and most colored gemstones you are relying on the gem cutter to maximize each individual sapphire's unique combination of color, clarity, and brilliance. In general, a well cut sapphire will be symmetrical and reflect light at the proper angles in order to enhance the stone's luster. It is often the case that gem cutters will cut more deeply when the sapphire's tone is light. The most common shapes of sapphires are usually oval, round, cushion, and emerald. The cabochon cut is also prevalent as a non-faceted, polished alternative. This shape displays the sapphire as a smooth oval, convex dome, and is the best way to show off a star sapphire's asterism. Most reputable jewellers offer consumers only the highest quality, authentic gemstones. Their colored gemstones undergo rigorous internal inspections by trained gemologists to ensure they meet our stringent quality standards. Due to their rarity and unique visual properties, nearly all colored gemstones sold at reputable jewellers, are enhanced using various techniques. Many of these techniques have been used for centuries. Colored gemstones that have not been enhanced are very rare and command extravagant prices. While white and fancy color diamonds are not enhanced in any way, other than normal cutting and polishing. Black diamond fashion jewellery contains natural diamonds that have been treated to create the unique black color. The application of heat to enhance the color and/or clarity of gemstones has been a common practice around the globe for centuries. It is part of the standard polishing and finishing process for many colored gemstones. As such, it is accepted by the jewellery industry and the American Gem Trade Association. The enhanced color and/or clarity of heat-treated gemstones is permanent. The alteration of a gemstone's color through the use of radiation. This is often followed by a heating process. The enhanced color of irradiated gemstones is permanent. Techniques for enhancing colored gemstones, either detectable or otherwise, are continually being developed. These may be difficult, or in rare cases, impossible to detect, even for the most sophisticated laboratory. Reputable jewellers will continue to work with industry groups and gemological experts who are committed to the identification and disclosure of new and future techniques in order to maintain our stringent quality standards. After removing your gemstone jewellery, clean it by following the directions on a non-abrasive jewellery cleaner. Make sure that the jewellery cleaner specifies that it is safe to use with your gemstone. Use a soft cloth to remove any remaining dirt or other residue. While it's true that gemstones such as ruby and sapphire are second only to diamond on the hardness scale, it is not a measurement of their indestructibility. It means that these gemstones are able to resist scratching almost as well as a diamond. Abrasive surfaces, harsh chemicals, and sharp blows can damage even the hardest gem. Your gemstone jewellery should be the last thing you put on when getting dressed and the first thing you take off at the end of the night. Store your gemstones carefully and they will be enjoyed for generations. When you're buying a sapphire, it's essential to see a high quality image of the stone for yourself. As you now know, color is the most important factor when buying a sapphire, and it would really be a foolish gamble to make a purchase without investigating the actual stone's hue, tone, and saturation.